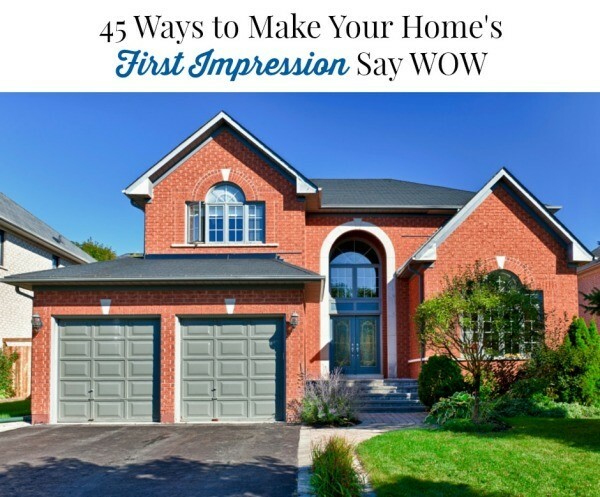 If I asked you what kind of first impression your home gives, what would your answer be? Cluttered, messy, tidy, beautiful, simple? When someone comes to visit your home, there are two places where they get that first impression: the front of your house and the entry way (or wherever they enter your home). There are simple things you can do to both spaces that give a great first impression. Not only that, but they make you feel good when you come home after a long day. I am all about simplicity. I don’t have a lot of things in my home. I don’t do knick- knacks and I like a room where you can walk around in it. That’s definitely not everyone’s taste and that’s fine, but de-cluttering and adding a few special touches can really make you feel good about your home and the first impression it makes. Here are some staging tips I put together for someone selling their home. 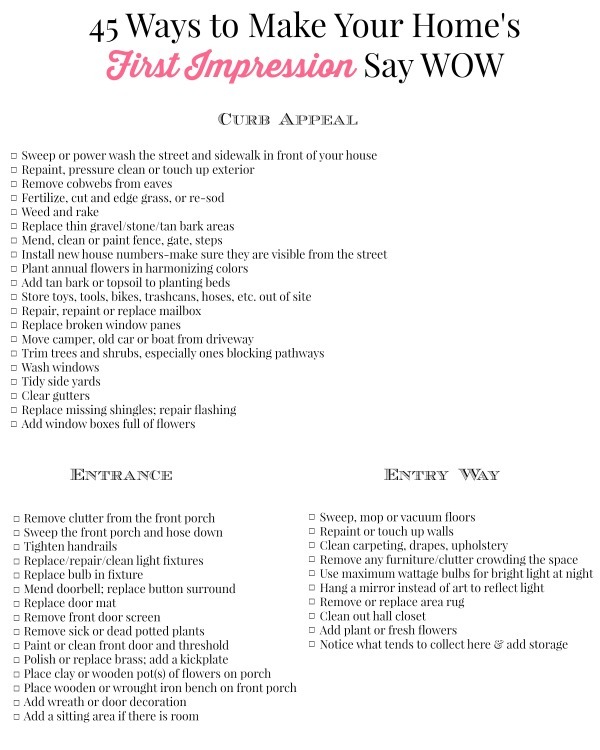 You can go through this same list when you are trying to make the outside of your home and the entryway pleasing to the eye. Obviously you are not going to do everything on this list, but it gives you some good ideas. 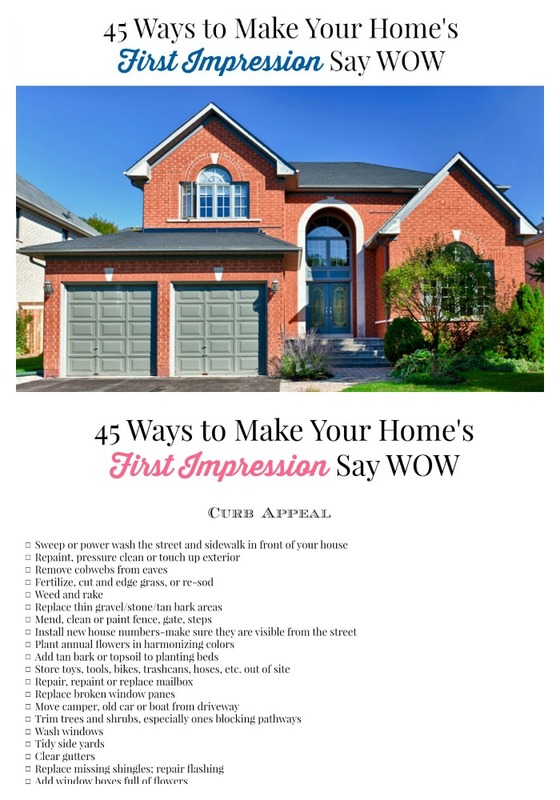 If you’ve ever shopped for a home, then you know really well how you first judge a home – by its curb appeal. I’ll never forget one time when my husband and I were looking for a rental home. There was this one house we drove by and I immediately said No way. Why? The grass hadn’t been mowed. The bushes weren’t trimmed. There were random items scattered in the yard. I didn’t even care what the inside looked like. I just knew I didn’t want to live there. After looking at several homes, my husband asked again about the “messy one”, as I liked to call it. I gave in and we went to look at it. Long story short, it ended up being a great home for us, with great neighbors for 3 years. But, if it wasn’t for my husband’s multiple suggestions to go look at it again, we would have never lived there. Shortly after we moved in, we gave it some nice curb appeal. Needless to say when it was time for us to move out, it rented out immediately. My husband laughs at me because I have a little pet peeve when it comes to our entrance at night. I want the porch light on, regardless of if we’re home or not. Why? Because of several reasons really. If we’re not home, being greeted by a lit up house is very nice when we do come home. If we are home, having the light on makes us look welcoming. I call it the nice house look. We look nice and it says come say hi. Am I right? I’m right. When I walk into my door at home, the last thing I want to be greeted with is clutter. It instantly stresses me out and puts my mood into funk mode. You know the mode I’m talking about? The one where everything, I mean everything, bothers you? Yeah. Not fun for anyone. I’ve done quite a bit of thinking and planning when it comes to our entry way because this “room” is one busy place. We enter here. We exit here. We place our stuff here. A few items I added to make sure this space is functional are a table, hooks to hang purses/bags, basket for keys and random items, a tote for shoes, a tote for miscellaneous items, decorations that are minimal and make me smile. Are you ready to get started? Print out the printable I provided and start checking things off your list. Your home will be welcoming for both visitors and yourself in no time.